A change is taking place all across the country and especially on the West Coast, a shift led by the younger generations. People who in years past might have headed for the suburbs are instead moving to the city or choosing not to leave. Many will live in apartments or condos. But in cities that have neighborhoods of detached dwellings (and most cities still do), people are buying, building, and fixing up little houses. Many people who already live in a little city house are staying put, remodeling perhaps, but not trading up or moving out. Others are building a little house in their backyard to serve as quarters for guests or extended family, or as a rental home for single people, couples, or small households, or even as an Airbnb for overnight visitors. A few intrepid souls are finding clever ways to fit a little house into novel spots in the city—building one on the rooftop of a warehouse, or repurposing an industrial structure, or transforming a two-car garage into a home. The 35 houses featured range in size from 500 sq. ft. to 1,600 sq. 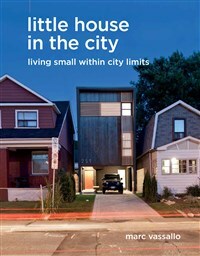 ft. and include infill houses, remodels, and backyard dwellings from all across North America. Marc Vassallo has spent over two decades in publishing and is former Editorial Director of The Taunton Press. His book The Barefoot Home was named Best Home & Garden Book of 2006 by Amazon.com. Vassallo has written for numerous magazines and literary journals and received a Fellowship in Fiction from the National Endowment for the Arts. He lives in Seattle with his wife and son. He is an avid backpacker, sea kayaker, and urban gardener.